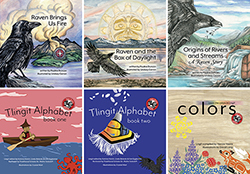 Sealaska Heritage Institute (SHI) will release six culturally-based children’s books that reflect the Native worldview as part of its Baby Raven Reads, a program for Alaska Native families with children up to age 5 that promotes language development and school readiness. The series includes a three-book set derived from ancient creation stories that have been passed from generation to generation for thousands of years. The set includes Raven and the Box of Daylight, Raven Brings us Fire, and Origins of Rivers and Streams. The books were adapted from oral histories by Pauline Duncan and illustrated by Lindsay Carron. The series also features a book that teaches the Lingít words for colors. The Lingít words in Colors were compiled by Yarrow Vaara, and the book was illustrated by David Lang. SHI also will release Tlingit Alphabet, a two-book set that was edited by Katrina Hotch, Linda Belarde and Keri Eggleston, reviewed by traditional scholar Dr. Walter Soboleff and illustrated by Crystal Worl. Readers who want to hear the sounds that comprise the Lingít alphabet may do so through SHI’s new app Learning Tlingit or through an interactive tool on the institute’s language resources page at www.sealaskaheritage.org. Illustrator David Lang will sign copies of Colors from 4:30-8 pm, Friday, Dec. 2, during Gallery Walk at the Walter Soboleff Building in Juneau. Everyone is welcome. People enrolled in SHI’s Baby Raven Reads program will receive copies of Colors and the other five books from 10-11:30, Saturday, Dec. 10, at SHI’s Baby Raven Reads family event. Sealaska shareholders who want to enroll in the Baby Raven Reads program may do so on Thursday, Dec. 8, at the Sealaska Holiday Fair in Juneau. The other five books also will be available to the public on Dec. 10 at the Sealaska Heritage Store. The release of the books is groundbreaking because so few culturally-relevant children’s books from Southeast Alaska exist that are not tailored for the commercial market. And, research has shown that Native students do better academically when their cultures are incorporated into learning materials and classes, Worl said. Tlingit Alphabet and Colors are geared for children up to age three, and the creation stories are intended for children up to age 5. The books will be available at the Sealaska Heritage Store in Juneau in early December. SHI in May released three other books in the series: the counting book 10 Sitka Herring, and Baby Raven and Baby Eagle, which teach the English and Tlingit words for clan crests. SHI also is planning to publish books that teach the English and Haida words for Haida crests. Baby Raven Reads is a culturally responsive kindergarten readiness program that is funded by an Alaska Native Education Program grant from the U.S. Department of Education: CFDA # 84.356A, PR# S356A140060.